Toledo was probably the most important centre for professional embroidery in Spain in the early 16th century and a number of fine examples survive in the Cathedral there. This altar frontal was found in the church of San Jauan de los Reyes in Toledo, for which it may have been made originally. It is embroidered with gold, silver, silver-gilt and silk threads in a variety of techniques and textures. Most of the embroidery is worked on applied pieces of silk. The two large medallions have scenes of the Baptism of Christ by St John and the Virgin and Child with the infant St John. Although the artist/designer cannot be identified, the style points to the generation of Spanish artists who were introducing Italian formal ideas into Spain in the first half of the 16th century. Altar frontal embroidered with scenes of the Baptism of Christ and the Virgin and Child in the main part. 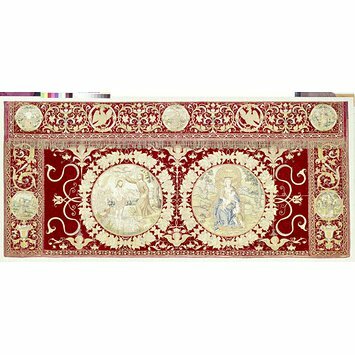 Cloth of embroidered silk velvet in gold, silver, silver-gilt and silk threads in split, brick and satin stitches with couched and applied work. In the centre of the upper band is Christ carrying the Cross, and is flanked by the eagle symbol for St John the Evangelist on either side. On the extreme left is the martyrdom of St John the Evangelist, and on the extreme right is St John the Evangelist with the angels. The side borders shows St Francis receiving his wounds, and St Catherine of Siena. Cloth of gold and silver on velvet. Embroidered in gold, silver and silk threads; split, brick and satin stitches with couched and applied work.